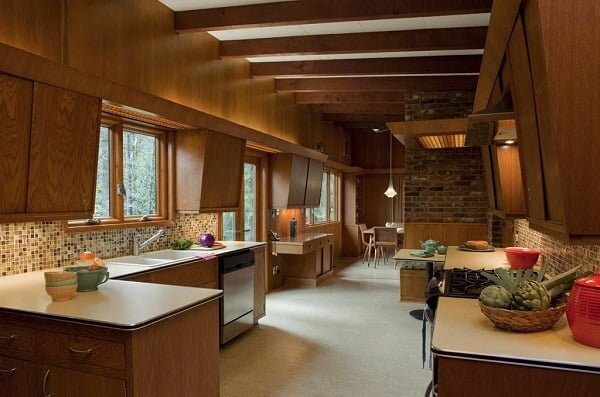 Looking for mid-century modern kitchen ideas? Here are the top 10 most creative designs that will inspire your big makeover in 2019. 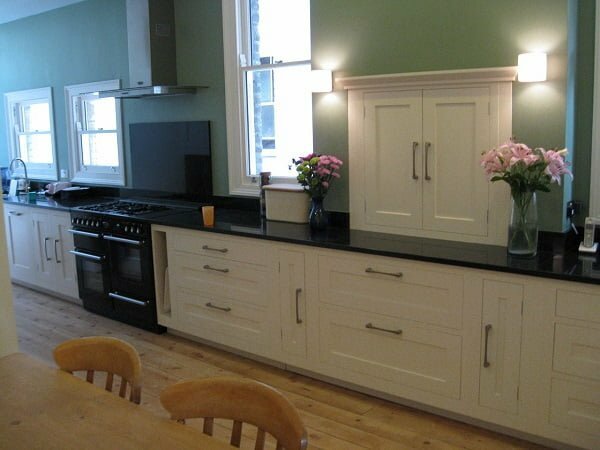 Renovating the kitchen in a particular style has to be one of the most challenging home projects that you can undertake. 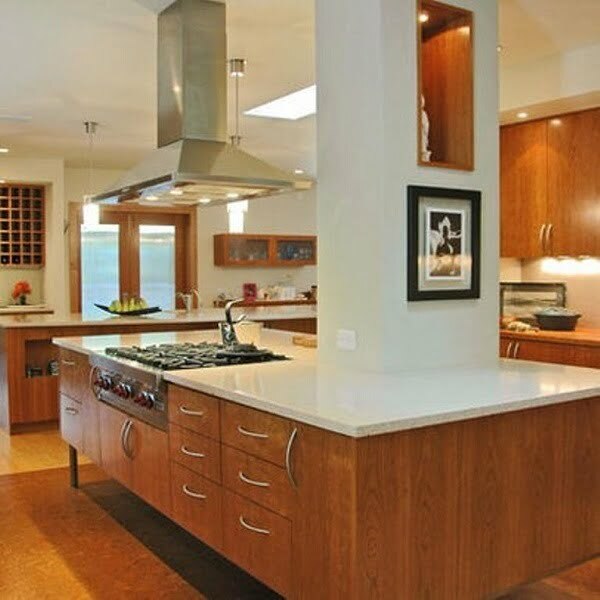 Decorating and remodeling a midcentury home can be even trickier – the large, open kitchens can far exceed the floor plan of the original space, while the color schemes and the furniture specific to this trend may be hard to execute. However, this project does not have to be that hard. Remodeling your kitchen in the midcentury fashion is not that complicated as long as you take into the account the characteristics of the style – namely, the pastels and bright, vibrant colors, the minimalist open space characterized by tall ceilings, few walls, wooden furnishings and vintage accessories. If you watched, V shows such as Mad Men or any piece of fiction set in the mid to late 60’s; you probably know what we are talking about. 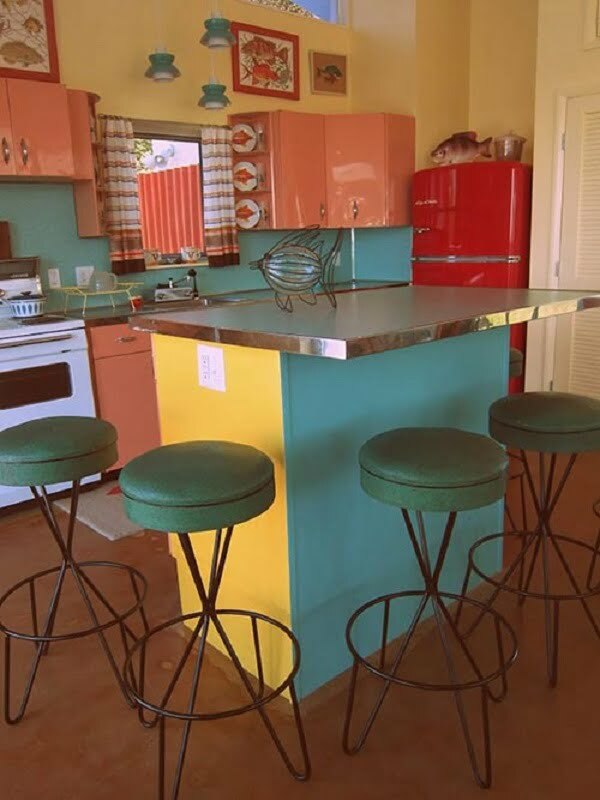 But enough about that – here are ten mid-century modern kitchen ideas. Whether or not expanding to a large kitchen is a good idea is one of the biggest debates amongst homeowners. The utility of this project depends on a lot of factors. First off, weight your options and evaluate your budget. Is the cost of tearing down walls worth it? Do you have something to gain by combining the living room and the kitchen (assuming they are next to each other, of course)? But this transformation is really worth it, if executed well. 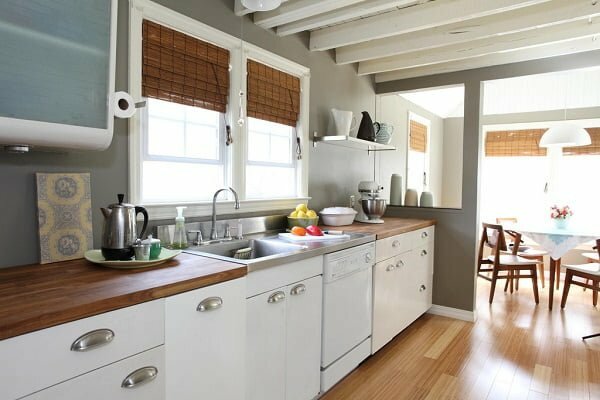 By focusing on a galley type of design, you can make your small kitchen space even more efficient. It will allow you to achieve an ergonomic space wherein all appliances are within easy reach. The mid-century design is mainly about the furnishings and the style of the furniture. The aesthetics is based mainly on wood. It might not sound like too much today because there is an abundance of materials that were not available when the midcentury design philosophy made its first break into people’s kitchens. By incorporating midcentury-specific finishes into your home, you can create a modern design with a slight, yet poignant touch. 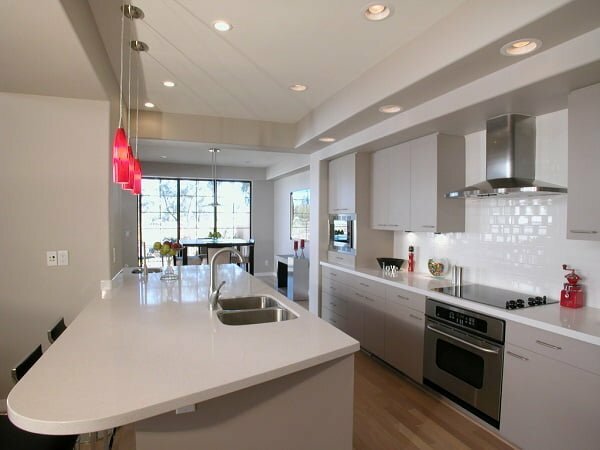 For instance, a good idea is to introduce quartz countertops, with either a teal and green color scheme or all around white, to create a distinct midcentury vibe. That, combined with the vertical wood paneling, will result in a design that respects the minimalist philosophy of the original style with a modern touch. If you love the midcentury design philosophy, few things are more retro than Nancy’s Back to the Future Pool House. Built in 2012, the house was designed from the ground up to look like it has been untouched since 1955. While the entire house is brimming with detail and 50’s memorabilia and gadgets, the creator has truly outdone herself with the kitchen. The center of the kitchen is dominated by a square-shaped, seafoam green table, surrounded by several barstools, an arrangement that will remind onlookers about old-timey diners. While the kitchen top features the same green as the table and barstools, the kitchen furniture features a bright, yet pleasant coral-orange with a slight shine and shiny metal edging. The cabinets are handcrafted to look like they have just been bought. If this is your kind of DIY project but you do not know where to start, you can learn to do it yourself with a bit of work and by following a few simple steps. 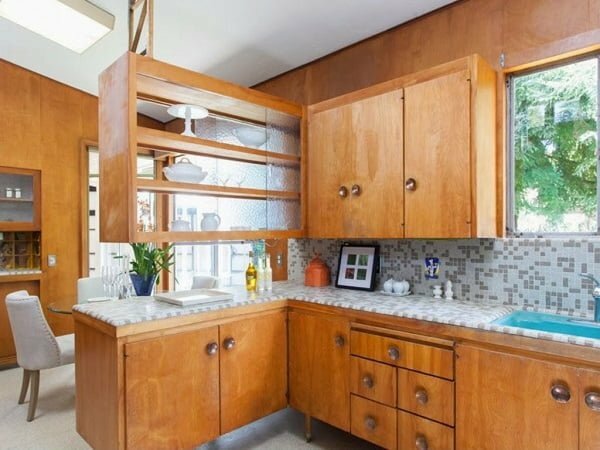 All in all, if you want to go for a midcentury style but with a specific thematic, Nancy’s Back to the Future kitchen is a good starting point. As vague as the concept of modern might sound, in this context, it makes total sense. The kitchen above checks all the boxes of the midcentury style – the big, stylish DIY cabinets, the spacious interior and the metal tops. From this point forward, it deviates from the style by adopting a white, brown and caramel walnut color scheme that is almost rustic in its appearance. 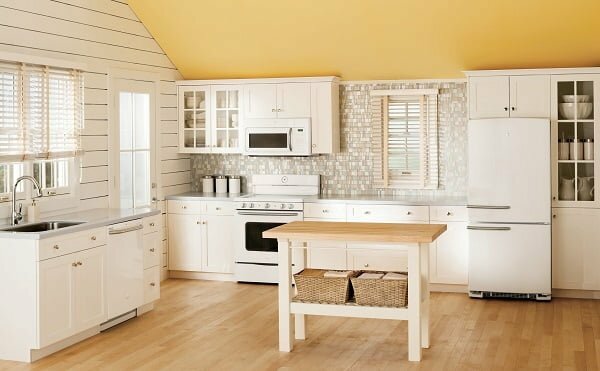 The result is a warm, calm and inviting ambiance that fits well with the kitchen’s overall retro aesthetic. So, if you do not like the bright colors and pastels, this is the way to go. For those of you who are not fans of pastels, bright colors and rustic designs, this design is the perfect way to compromise and respect the principles of the midcentury trend. The prevalence of white, combined with midcentury furniture, is the perfect way to achieve a neat and clean appearance. Do not hesitate to go for an all-white scheme out of a fear of making the kitchen look bland and uninviting. Add the right furnishings (brightly colored curtains, for example, to contrast the white motif) and your kitchen will feel very cozy. Have you ever wanted a mid-century kitchen with the look of a cabin, but with the convenience and comfort of the modern kitchen? Then this design might be up your alley. The prevalence of natural wood materials and a color palette focused on creamy, light colors creates a warm and cozy ambiance. The layout of this kitchen, favoring a linear design rather than a rectangular, centralized design is a good way of maximizing limited space and creating a feeling of coherency and seamlessness. Furthermore, the symmetric wooden beams add an additional level of intimacy to the space by making everything feel close to each other, but not to the point where it becomes claustrophobic. Do you feel a tinge of nostalgia when watching films such as the heartbreaking Diner or the dark, yet glamorous L.A. Confidential? You can recreate that particular aesthetic by taking some hints from this design. The kitchen itself (meaning the place where the actual cooking is done) is arranged in a L-shaped layout, with everything, from the oven, sink and cabinetries located there. On the left, right below the shelves, there is a small opening with direct access to the dining area, similar to what you would see in a midcentury diner. To add a touch of color and novelty to the design, the creators decorated the walls with asymmetrical square arrangements. If you are looking for something a little more thematic, this is a great design idea. Built-in 1955 by Lawrence Langer and Emil Konoposki, two nuclear physicists who were involved in the Manhattan Project during the Second World War, the house exemplified here was carefully restored in 2004 with a few upgrades. The new owners made sure to retain style-specific elements while adding a few personal touches to make it look slightly modern. The kitchen itself is a true work of art. It nails a particular style that can’t be fully expressed in words to perfection. 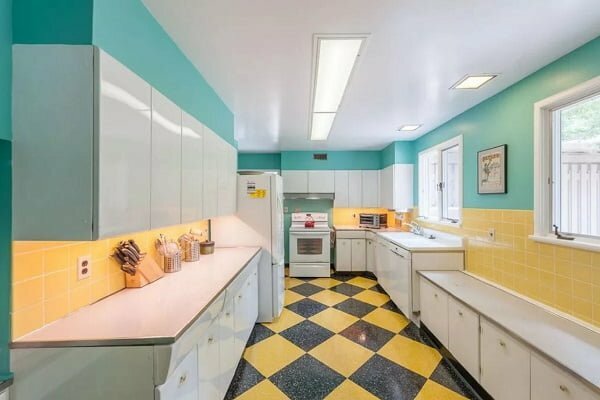 The room, with its white, shiny countertops, yellow slates, and green walls looks exactly how an atomic shelter kitchen should look like, but with a retro-futuristic charm that is very hard to recreate. The galley is the quintessential element of the midcentury kitchen, and this design takes full advantage of it. The overall layout of the kitchen is based on a linear, gallery-like design adorned with white furnishings and cabinetry. Even though it might appear cramped at a first glance, the design is actually very ‘’breathable’’ and ergonomic, as the linearity of the kitchen means that everything is within easy reach. If we were to pinpoint the authentic mid-century design, this is how most people would imagine it looking like. 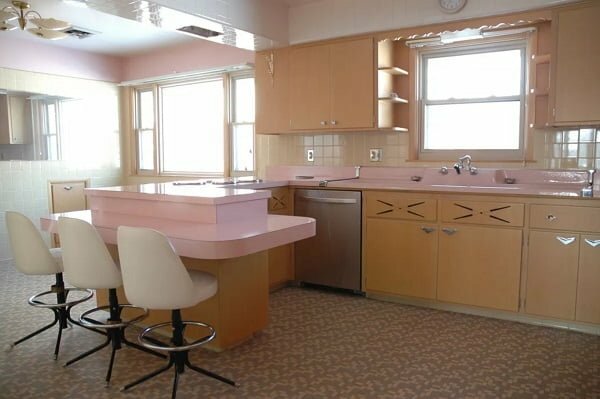 The design screams of 1950’s charm, with crème colored furniture, white barstools and washed-out pink countertops. But for this style to make sense, you would have to equip the kitchen with a few era-specific gadgets. As you can see from the image, everything from the saltshakers, lamps to the refrigerator look like they have been preserved in a time capsule. Of course, nobody is saying you should respect it religiously, but adorning the kitchen with a few vintage trinkets is a surefire way to achieve to achieve that aesthetic. This concludes our article about mid-century kitchen. 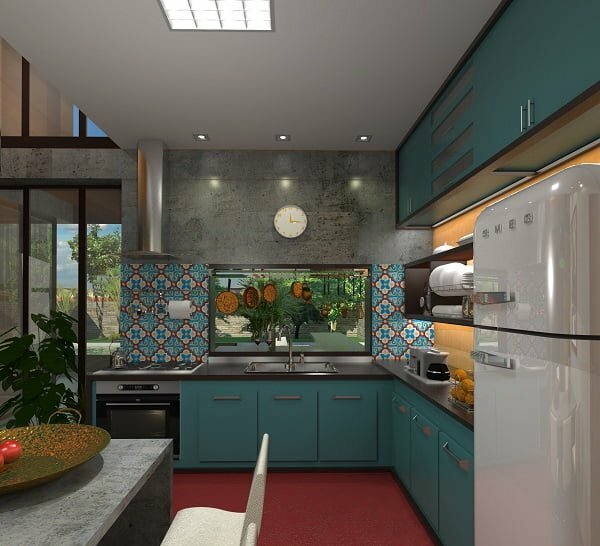 The advent of nostalgic media has brought with it a resurgence of retro style home designs, with mid-century kitchens in the lead. The designs highlighted in this piece are mere concepts, so feel free to modify them as you wish. Kathy Hardess is a southern interior designer and a healthy lifestyle promoter. She’s a do-it-yourself kind of person – from redecorating her balcony to inventing healthy recipes, she will help you with everything. She also publishes her ideas on DIYFormula.com, a website dedicated to all DIY related matters.